A new direction in local food. Ok – It is November 2016 and I am starting to feel like I am getting on top of things. The house I moved to bare land is totally liveable and I am hopeful that we will have a bathtub in the next 2-3 weeks. Something I am really looking forward to. The TruckFarm is still alive and well although I have taken it off the road while I get other things done. Like so many other people I could use a couple more of me. For those of you who are new, a couple years ago I purchased 2 acres of raw land in the Fraser Valley and moved a log house from San Juan Island to my property on Bear Mountain. It has been a steep learning curve. First we had to clear some of the land and put in a driveway. And moving a house is no small task – but I will try to do a post dedicated to that. We had to bring in all the utilities as well as put in a new 336 ft deep well, a septic system and water filtration system all of which require a degree of maintenance and upkeep. We had to do perimeter and cross fencing to help protect everyone who lives here – including the bees, bunnies and chickens. There will be goats here as soon as the pole barn is finished – we have a roof but are a bit short on walls. Then there is the orchard, green house and raised beds. Today I finally finished planting about 1,200 garlic (I lost track after 950). I am trying out a few heirloom varieties including: Chesnok Red, Susan Delafield, Northern Quebec, Italian Artichoke, Deep Purple, Persian Star, Yugoslavian, Puslinch, Uzbekistan, Doukhobor Russian, Saltspring Extra Early, Yugoslavian, Russian Red and Metechi. I may have gotten a little carried away. (Nothing new there!) I am debating whether I will put in some Music as well. A friend just sold her house and is rehoming her koi with me so we are also racing to get a large pond completed. We are trying to reuse as much as possible to build it. So far we have old carpet donations from three people and I am picking up another one tomorrow. The carpet is being used as an underlay to keep the liner from being damaged by rocks or roots. As you can see, once again I might have gotten carried away, it is a rather big pond. There is so much I want to tell you all but so little time to spare right now. I feel like I should do a post for everything we have going on – again, getting carried away. I will leave you with this one last parting shot that will give you an idea of why I fell in love with this place. Well, Saturday Oct 12 marks the second March Against Monsanto. Although they are the quintessential face of GMOs they are not the only company messing with our plants, our food and our seeds. 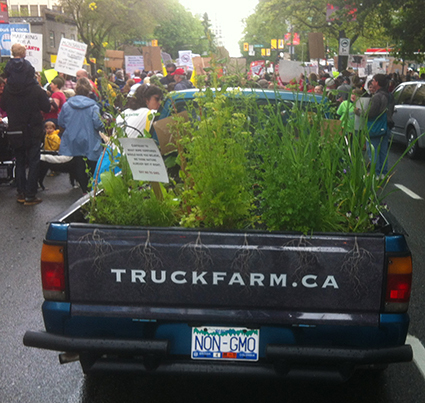 The Truck Farm will be participating in the march in Vancouver. If you care about this issue please join us and millions of others. We could go on and on, but frankly, we think the photo says it all. The Truck Farm looked so lonely when I parked it at the PNE before it opened. I have stopped in to check on it a few times over the last week. Sadly, I missed the chance to see Great Big Sea live. Planning to see Corb Lund on Sunday. We did get to the Super Dogs. The Truck Farm was a dog transport truck for years while I competed in and judged dog agility events, so I like to see what the Super Dogs are up to. Highly recommend the pig races too, but get there early if you want a seat. I also love all the 4H excitement. The kids are so excited and passionate about their animals. Ethan and I spent a lot of time talking with a girl about her bunny and a boy about his sheep that he was getting ready to take into the ring. It is like a small taste of a simpler time and place. I hope the PNE never loses touch with its agricultural roots. In fact I think that in the next few years they will have an even greater opportunity to teach people more about growing, preparing and preserving food. It is already a resource for everything from growing mushrooms and keeping chickens to raising bees and growing food (like in a truck). Tomorrow I think I will take the kids there for a bit of dinner and check out the beach boys. Yet another example of a simpler time. Wow! What an event. We we’re kept on our toes for the whole time we were there. Getting there was a bit of a hurdle in itself with all the streets closed we had to navigate back alleys and move a couple road barriers to get to our spot in front of Nineteen Ten. We were a little behind and people started coming to talk with us before we even got our tables set up! We did a couple demonstrations of our Quick & Dirty self watering containers but eventually had to stick with talking with people about the Truck Farm, seeds and the few plants we brought to sell. Because we have some containers left over there is talk of doing a Quick & Dirty workshop at Nineteen Ten. We will be posting more info on our Facebook page. We met so many incredible people that day. Including this very pregnant woman who is about as foodie as they come. In case you are wondering, our next scheduled event is the Epic Sustainability Fair. We will be parked by Whole Foods. 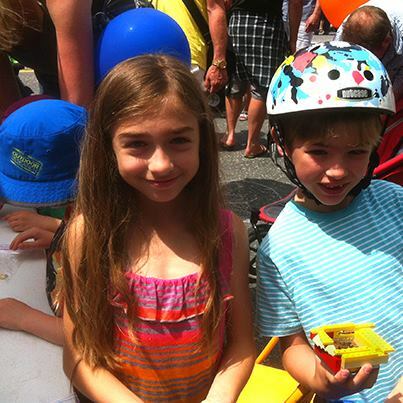 Follow us on Twitter or better yet, Like us on Facebook to find out more events coming up this summer. Wow. There were a lot of people who came out the the march. Kudos to the organizers and the hundreds of people who were willing to brave the rain to stand up for our right to healthy, safe food resources. I have to say it was a bit of a baptism by fire. I had never spoken in front of a large group before and standing before a sea of people willing to listen to what I had to say was both humbling and empowering. I was also so impressed with the other speakers who were so incredibly well learned and articulate. I am not a scientist, or the CEO of a big food company, or farmer. I am just your average mom who is passionate about creating a better future for my children, and getting my hands dirty in the backyard. In case I botched it more than I hope I did, the basic message I wanted to get across it that our ability to facilitate change lies in our knowledge and understanding of the people and corporations who want to control our food resources and the science behind genetic modification of food. It is imperative that we do everything in our power to demystify GMOs and dispel the myths and half-truths that are promoted by Monsanto and other companies involved in genetic modification of our food. Monsanto’s biggest fear is an educated consumer who is willing to ask hard questions. It is our job to educate, enlighten, engage our friends, families and coworkers until everyone has enough knowledge and the passion to stand up for equal access to sustainable food resources or to put it more simply, a diverse variety of non-GMO, open-pollinated seeds. Thank you all for listening. The Lower Mainland Christmas Bureau helped us out with a new power steering belt making parallel parking possible again. On January 1, we filled in the hole and planted garlic, thyme and some swiss chard we had growing in a planter. New beginnings. We had a blast in 2012 and the icing on the cake was Christmas. We came up with a hair-brained idea to help raise awareness and funding for the Lower Mainland Christmas Bureau. And what a wild ride that became! In keeping with our mandate to encourage people to grow their own food from open-pollinated, non-GMO seeds. Much to our delight, we discovered that White Spruce is edible. (We found a number of recipes for everything from spruce jam to spruced up martinis.) We created Christmas Wishes: a collection of White Spruce seeds with complete instructions for preparing, germinating and growing Christmas Trees from seed along with information on the history of the Christmas Tree. But how to make people aware. Especially with no marketing budget. Hmmm. And it hit us. Why not plant a spruce tree in the Truck Farm. Oh, and what if we decorated it. Maybe some lights… and ribbon. We contacted Figaros’ Garden (one of the first places to sell our seeds) and asked if they would be willing to donate a living spruce tree. They jumped on the idea. That little success spurred us to drop by Magnet Home Hardware on Commercial Drive and see if they had battery operated Christmas tree lights that they would be willing to donate. After seeing the Truck Farm, they couldn’t have been more into it. We went out and bought some ribbon and the kids at Raycam and Lord Strathcona community centres made some decorations for the tree. The tree arrived at Figaro’s and we drove up to get it (with iPhones taping the whole thing). We planted it in the truck right there on Victoria Drive and drove directly to Magnet to pick up the lights. Once we got back to our home base in Strathcona we put on the lights ribbon and some of the kids’ decorations (which sadly did not handle the wet weather, even after we coated them with polyurethane and had to be replaced with hand painted wooden ornaments.) Then we surrounded the tree with ornamental kale to represent gifts under the tree. And, just for good measure, we bought some heavy duty chain which we wrapped around the tree and connected to the truck with a padlock. We had lost a few things over the past few months and wanted to be sure the tree stayed put. It was so sweet, and quirky. We kept a stack of Truck Farm sample seed packs in the glove compartment to hand out. People waved, gave us the thumbs up, even blew kisses! At one point the preschoolers from Phil Bouvier Daycare sang Christmas Carols. Driving around in the Truck Farm became the perfect cure for almost anything. Wherever we parked at least a few people would gather and take photos. (Apparently they are all over Instagram.) Occasionally we would get looks from police. We weren’t sure but we had a feeling we might be crossing some kind of line with a twinkling Christmas Tree planted in the back of our truck. Research (OK we finally asked an officer) revealed that it is illegal for vehicles to have flashing red, blue or white lights unless they are emergency vehicles. Apparently “warm” white, which is what we had, is OK because it is more golden than white. And, besides, you’d have to be a pretty grinchy cop to ticket someone for having a Christmas Tree twinkling in the back of their pick-up. To help us out Thumbnail Brand Corporation designed some signs and Eyezone printed them up. We planted them in the back with the tree when it was “on display” at Lonsdale Quay and the Great Canadian Christmas Craft Fair (we almost got towed from that one!). We didn’t sell as many of the Christmas Wishes as we would have liked, but it is the first year and we might just give it a shot again next year. We had hoped to be able to grow the tree a little more for 2013 and use it again. Unfortunately it came to a sad end on New Years Eve. At about 9:30 that night a neighbour came to tell us that they noticed our tree was missing. We checked it out and sure enough there was a hole where is was once planted. Some of the kale was smashed and there was dirt smeared down the sides and trailing off down the sidewalk. We followed the trail for a block and found some of the ornaments, parts from the lights and a portion of the root ball. We called the police and they kept a look out for the tree but it never showed up. Hopefully, we will get lucky again and get a tree and lights donated next year. In the meantime, here are some retrospective photos. As for the video, it is still in post – we had hoped to get some footage of the tree while we were driving but the tree was taken before we got a chance (we were a little behind schedule anyway). Truck Farm? Is it for real? I hear this from a lot of people who just can’t believe someone would drive around with vegetables growing out of the bed of their truck. But in order to get your message out to people you need to stand out unless you have a multimillion dollar budget, which I don’t. And to stand out you have to be different. 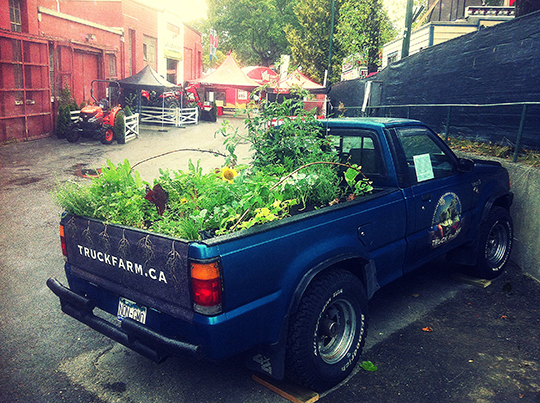 The Strathcona 1890 Truck Farm was created to give people a small taste of what urban gardening is all about. This is especially helpful with our visits to schools and daycares. 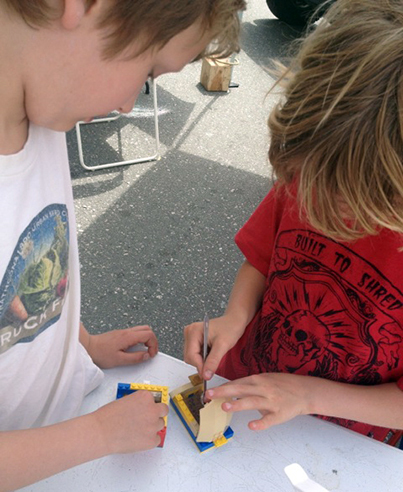 Kids can get bored easily and need stimulation to get them to truly engage. In short, it needs to be fun and entertaining. The truck farm does the job, in spades. Ours is the first Truck Farm in Vancouver, and likely Canada but there is a small growing fleet in the US. 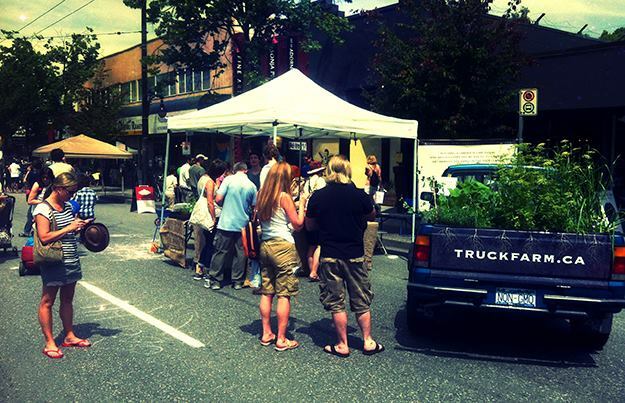 I had heard of a Truck Farm that was wandering the streets of Brooklyn and wanted to bring the concept to Vancouver. I already had a 1993 Mazda which had been “relaxing” in the back alley for six years which was smaller than the Brooklyn Dodge making it an even better demonstration of small space gardening. I came up with a way to lighten the load while increasing the soil depth so I could also incorporate carrots (which I love) and other root vegetables. It is currently planted with sorrel, Swiss Chard, Chiogga Beets, Turnips, Rainbow Carrots, lettuce, tomatoes, parsley, chives, nasturtiums (edible flowers), snap peas, Red Runner Beans, dwarf sunflowers and miniature pumpkins. We are expecting quite the harvest. 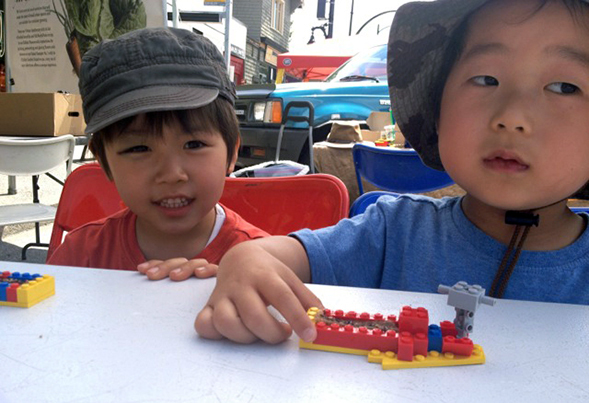 Apart from visiting schools and daycares, the Strathcona 1890 Truck Farm travels throughout Vancouver. It takes between 3-5 minutes to start gathering a crowd. Every one who stops to chat with us also gets a sample pack of Strathcona 1890 Truck Farm Seeds to try their hand at growing food (while they last!). I have heard so many great stories over the last few weeks. From one woman who was snapping photos to send to her father who is a farmer in Japan, to another who regaled us with stories of milking the cows and sneaking veggie treats from neighbouring farmer’s fields. 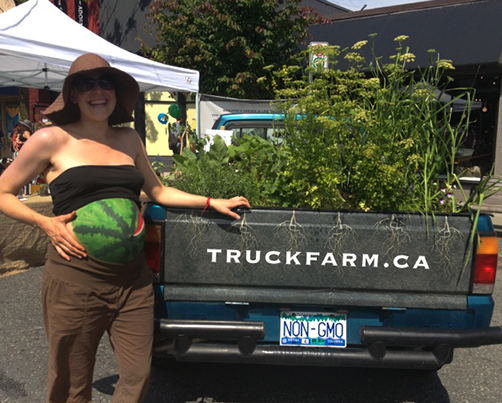 Over the next few seasons the Truck Farm will work to bring change to the Vancouver landscape in the form of more balcony, rooftop and container gardens. 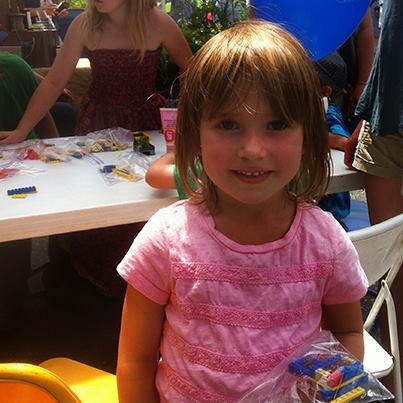 No matter how small the change I know the Truck Farm has put a smile on faces young and old. I hope you will follow the Truck Farm’s travels. It is sure to be an interesting journey.